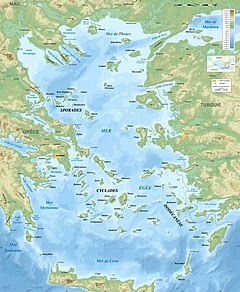 The Aegean Sea (/ɪˈdʒiːən/ or /eɪˈdʒiːən/; Greek: Αιγαίο Πέλαγος Aigaío Pélagos [eˈʝeo ˈpelaɣos] ( listen); Turkish: Ege Denizi [eˈɟe deniˈzi]) is an elongated embayment of the Mediterranean Sea located between the Greek and Anatolian peninsulas i.e. between the mainlands of Greece and Turkey. In the north, the Aegean is connected to the Marmara Sea and Black Sea by the Dardanelles and Bosphorus. The Aegean Islands are within the sea and some bound it on its southern periphery, including Crete and Rhodes. ^ "Drainage Basin of the Mediterranean Sea". Second Assessment of Transboundary Rivers, Lakes and Groundwaters (PDF) (Report). UNECE. August 2011. ^ Henry George Liddell, Robert Scott, A Greek-English Lexicon, s.v. "αἰγιαλός"
^ "Aegean Sea | Mediterranean Sea". Encyclopædia Britannica. Retrieved 18 October 2017. ^ Administratively, the Greek Dodecanese also contains Kastellorizo, situated further east outside the Aegean proper. ^ "Limits of Oceans and Seas, 3rd edition" (PDF). International Hydrographic Organization. 1953. p. 18. Retrieved 15 February 2016. ^ Aksu, A. E., D. Yasar, et al. (1995). "LATE GLACIAL-HOLOCENE PALEOCLIMATIC AND PALEOCEANOGRAPHIC EVOLUTION OF THE AEGEAN SEA – MICROPALEONTOLOGICAL AND STABLE ISOTOPIC EVIDENCE." Marine Micropaleontology 25(1): 1–28. ^ Tjeerd H. van Andel; Judith C. Shackleton (Winter 1982). "Late Paleolithic and Mesolithic Coastlines of Greece and the Aegean". Journal of Field Archaeology. Journal of Field Archaeology. 9 (4): 445–454. JSTOR 529681. ^ John F. Cherry; Despina Margomenou; Lauren E. Talalay. The familiar phrase giving rise to the title Prehistorians Round the Pond: Reflections on Aegean Prehistory as a Discipline.